India’s Jawaharlal Nehru National Solar Mission, launched in 2010, is “well-poised to make India a global leader in the development of solar power,” says the World Bank. Aiming to install 20 GW of solar power by the yer 2020, India is already well on her way, having grown from an installed solar capacity of only 30 MW in 2010 to 2,000 MW in 2013. 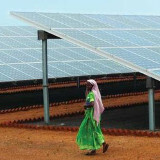 A new report released by the World Bank – Paving the Way for a Transformational Future: Lessons from JNNSM Phase 1 (PDF) — notes that solar power can reduce India’s dependence on foreign fuel imports, reduce greenhouse gas emissions, and contribute to the country’s energy security — all facts that are well known, and not restricted to India alone. Such bundling of solar power with cheaper conventional power helped reduce solar power tariffs for distribution utilities. The reverse bidding mechanism enabled qualified bidders to benefit from declining global prices for solar components, thereby reducing the purchase price of both solar PV and Concentrating Solar Power (CSP) for the utilities. Under Phase I of the program, scheduled commercial banks mostly shied away from lending for solar projects while export credit agencies, multilateral financial institutions, and some nonbanking financial institutions took up most of the financing. However, given that most infrastructure lending in India has been led by commercial banks, the solar program too will need their active participation to scale up to the levels envisaged. The provision of publicly developed infrastructure frees private providers to focus on solar power development, increases efficiency, and lowers costs. Gujarat, for example, was the first state to declare a solar policy (2009) and today, is at the forefront of solar power generation in India. Its first solar park, developed on waste land in Charanka (Patan district), has the largest solar capacity in Asia. The park provides developers with already developed land along with critical infrastructure, including facilities for power evacuation and transmission, roads and water, thereby ensuring the rapid development of solar projects. India’s solar PV manufacturing capacity is limited and does not straddle the higher technological echelons of the industry. This is because India’s manufacturers lack the raw materials, do not have access to low-cost financing, and face underdeveloped supply chains. In CSP, where local manufacturing is more complex, India has not been able to manufacture some critical components. Either technology suppliers are limited and their products patented or the lack of natural resources poses an impediment. India should therefore seek to define and develop its manufacturing capabilities in specific parts of the value chain where it enjoys a comparative advantage and can emerge as a globally competitive producer. An earlier ESMAP-World Bank study, Development of Local Supply Chain: A Critical Link for Concentrated Solar Power in India has identified the potential for reducing the costs of CSP components in India through local domestic manufacturing. World Bank Foresees Potential For 20 GW Indian Solar Future was originally published on: CleanTechnica. To read more from CleanTechnica, join over 30,000 other subscribers: RSS | Facebook | Twitter. There is rapid solar industry growth in India, but very rapid electrical growth in general. The WNA says India plans to grow their 200 GW grid by 50% between 2012 and 2017; not surprisingly, 75% of the added capacity will be coal fired. India got 68% of its electricity from coal in 2011, 15% from gas, 12% from hydro, and 3.7% from nuclear (from 4.4 GW, expected to grow to 15 GW in 2021). GWEC says India had 18.4 GW of wind as of 2012, growing at 2.3 GW/year. Asssuming 30% capacity factor, this should provide over 4% of India’s total generation (similar percentage as in the US). So basically, grid-connected solar is “insignificant” in India now, and will grow to be “very small” in 2020. Non-fossil as a group (lead by hydro) is “substantial”, and growing. There's an election happening this year in India and PM Narendra Modi wants India to know that his government has eliminated the electrification gap between its towns and villages. But experts are skeptical about his claim. This article does a..
India has begun paying Iran for oil in rupees, a senior bank official said on Tuesday, the first such payments since the United States imposed new sanctions against Tehran in November. Opting for green energy transition can offer release from economic and environmental binds of fossil fuel. However, to unleash green energy transitions’ full potential, which promises to build a better economy and industrial structure for a..